The Widemouthed Anode Beetle (オオグチエレキムシ?, lit. 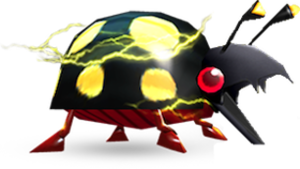 : "Big Mouthed Electric Bug") is an enemy found in Hey! Pikmin. The Widemouthed Anode Beetle patrols a set path in dimly-lit areas, where it casts a field of light. If Pikmin walk into this light, it will charge them and attempt to eat them. Widemouthed Anode Beetles can be defeated by continually throwing Pikmin at them until the flip over, which leaves them completely vulnerable to attack, much like the standard Anode Beetle. The creature attacking, dead, and a back view of it. The Widemouthed Anode Beetle in the cutscene in Glowing Bloom Pond. A Widemouthed Anode Beetle turning around in Secret Spot 7. This page was last edited on March 28, 2019, at 17:37.